The AtlasPROfilax® Technique is for everyone, from babies to the elderly. The spine of elderly people may never be perfectly levelled, but tensions and pains could be greatly reduced, their balance and posture may improve and they would have a much better quality of life. Anyone with problems with the spine, neck and joints are highly recommended to check their C1 alignment. However, we recommend this procedure to nearly everyone for the purpose of prevention, as according to studies, 98 % of humans beings have the Atlas out of alignment (at different degrees) from birth, due to an inherited defect or to the mechanical stress during the birth process. Traumas, such as whiplash, falls, intubation during surgery under total anaesthesia, can worsen the misalignment. The conventional medicine does not consider the Atlas misalignment a possible cause of disorders in the patient, furthermore it does not show up in regular X-rays or magnetic-resonance imaging. As a result this problem generally goes undiagnosed. R.C. Schümperli developed a unique method to safely realign the atlas with just one application. The AtlasPROfilax® application consists of a safe, strategic, non-chiropractic massage to the short musculature of the neck, to loosen the tension and allow the atlas to return to its natural position. 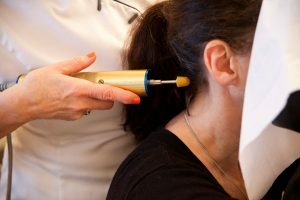 Marie uses a specially designed hand held patented device (AtlasPROfilax® Wellness) that massages the muscles and soft tissues around the Atlas (not the vertebrae itself). When the muscles are loose, the Atlas can slide down gently into place by itself, Marie just guides it. There is no popping, twisting or cracking of the neck vertebrae, or any kind of chiropractic manipulation, or anything that might be traumatic, it is non-invasive and very safe… This is a non-medicinal and non-chiropractic Technique.. The first session is for a consultation and includes the Atlas realignment (note that no charge will be made if your C1 is assessed to be in its correct neutral position). The approximate duration of the session is about 45 minutes, including briefing, patients’s medical history, kinesiological tests, anthropometric measurements prior implementation of the therapy. Those tests are performed before and after the AtlasPROfilax® procedure. 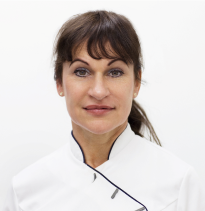 Marie-Agnes uses a specially designed hand held patented device (AtlasPROfilax® Wellness) that massages the muscles and soft tissues around the Atlas (not the vertebrae itself). When the muscles are loose, the Atlas can slide down gently into place by itself, Marie just guides it. 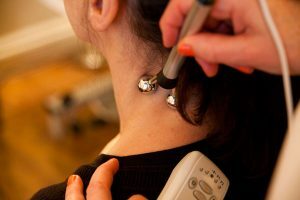 There is no popping, twisting or cracking of the neck vertebrae, or any kind of chiropractic manipulation, or anything that might be traumatic, it is non-invasive and very safe… This is a non-medicinal and non-chiropractic Technique. The second session (free) is for a check-up, any muscular release massage required and to also clear any negative cellular memory, helping the body to adjust and realign, We use a space technology Scenar device (Self Controlled Energo Neuro Adaptive Regulation). the late 1970s, a russian team of doctors and scientists developed a method of treatment that was energy efficient, multi-applicable, portable and also non-invasive, using electrical signals to stimulate the immune system. Scenar was immediately dubbed the “star Trek” Device by the press because of its origins and its similarity to the “all-curing” medical scanner used in the series Star Trek. 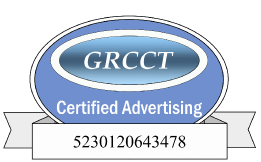 This second session can be done either a few weeks or months later. Body cells and organs do not, however, regenerate overnight. Likewise the restoration of skeleton balance and posture improve gradually depending on the physical constitution of each individual. Following the AtlasPROfilax® Wellness Technique, it is possible that you could experience a variety of responses all of which indicate self-healing has begun. These may include tiredness and muscle tension around the neck and lumbar region. You may experience mild versions of past ailments which have not completely healed. They can present themselves temporarily and in changed form. We recommend you observe your body carefully and write down changes in the way you feel. Support the self-healing process with regular back and neck massages as well as relaxing baths. The AtlasPROfilax® Technique only needs to be applied once in most cases. However, as stated the body and organs do not regenerate overnight. Some additional treatments such as massage, diet, detoxifying procedures, may also prove beneficial to support the process commenced through having the Atlas realigned.In addition, other treatments and therapies may be more effective as a result of a corrected Atlas. The AtlasPROfilax® Wellness procedure should only be performed by a specialist who has been trained, assessed and certified by the AtlasPROfilax® Academy in Switzerland, SA CH 3960 Sierre, preferably by a practitioner who has achieved the highest level of education. The method is non-medicinal and is non-chiropractic. This picture shows a misaligned Atlas to the left side. 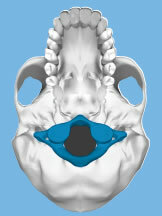 The rotation causes a reduction in the diameter of the aperture at the base of the skull and vertebral canal. This disrupts the normal flow of information between the brain and body through the vertebral and carotid arteries, and the lymphatic system, the cerebrospinal fluid, the meningeal system and the spinal cord. This picture shows a relocated Atlas bone. The Atlas carries not only the skull, but also facilitates SUSPENSION, BALANCE and CONTROL of the human spine and skeletal system. Additional information relating to research studies undertaken by Prof. Dr. Rainer Seibel at the Radiological Institute Diagnosticum, one of the most advanced medical centers in Germany, and part of German University of Witten-Herdecke can be viewed here: AtlasPROfilax Clinical Studies. One example of a major change to the posture that could be caused by a misaligned Atlas is the scoliotic pelvis. 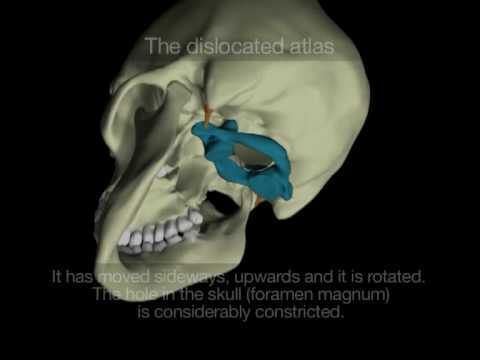 The Atlas should be sitting level, or square, on the cervical spine (neck), and the head should be square on the Atlas. It basically asks the question: “Is your head on straight?” The Atlas is the top bone of the spine. It is the vertebra that the head sits on. Misalignments may often be deceiving. Even though symptomatic pain may occur in the lower back, legs, shoulders, arms or other parts of the body, their cause is very frequently located in the cervical spine (i.e. neck). How does this unique method differ from general chiropractic treatment? One of the most obvious differences is the gentle way in which the practitioner works. No strenuous manipulation is needed. The method consists of applying a patented device, AtlasPROfilax® Wellness, on the short neck musculature to loosen the existing tensions and allow the Atlas to come back naturally into its normal position. The AtlasPROfilax® method works on freeing the soft tissue and musculature around the vertebrae but not directly on the vertebrae themselves. There is no popping, twisting or cracking of the neck or any cervical joints. 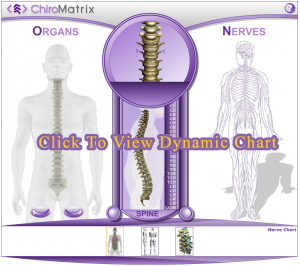 As previously stated, the method is very safe, non-invasive, non-medicinal and non-chiropractic. 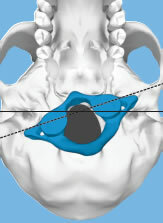 Additional information and summaries of research studies relating to the AtlasPROfilax® method undertaken by Prof. Dr. Rainer Seibel at the Radiological Institute Diagnosticum, one of the most advanced medical centers in Germany, and part of German University of Witten-Herdecke can also be viewed here: AtlasPROfilax Clinical Studies.